Roughly translated as “jumping flea”, the ukulele has long been associated with music from Hawaii, where it originated and was developed as a concoction of the Madeiran braguinha and raj√£o. Being similar in appearance as the cavaquinho, the braguinha originated from the city of Braga, thus its name. With regards to its tuning, the Madeira raj√£o is tuned D-G-C-E-A, while the Portuguese cavaquinho is tuned D-G-B-D, in G-Major chord. Both the D and G strings are re-entrant, which means that they are always tuned an octave higher than what is usually used in regular low-high string course. The GCEA strings of the raj√£o, on the other hand, is the basis for the tuning of the modern ukulele. Ukuleles made from Koa wood or Acacia Koa is one of the most expensive types of ukuleles today, which can easily sell for thousands of dollars. They are well-known for their elegant color and appearance, as well as their exceptional tone. During the Panama-Pacific International Exposition, the ukulele started to gain popularity due to the regular performances by the George E.K. Awai and his Royal Hawaiian Quartette in the Hawaiian Pavilion, which featured an ensemble of guitars and ukuleles. These performances started a fad for Hawaiian-themed songs among Tin Pan Alley songwriters. They were also the one who introduced the lap steel guitar and ukulele in the United States mainland music, where it was highly popularized by theatre performers in the likes of Cliff “Ukulele Ike” Edwards and Roy Smeck. The ukulele then started to become an icon of Jazz Age, attributable in part to its portability and inexpensive nature, which also have become a hit for amateur musicians coming into the year 1920. This can be seen in the introduction of tablatures for ukuleles in most music sheet publications at that time. Examples of well-known manufacturers of these instruments include Harmony, Regal and Martin. Gut Strings – Italian gut strings have already been in production in the beginning of the 17th century, in places such as Verona, Venice, Padoa, Vicenza and Treviso. Historical data provides evidence that these type of materials were manufactured consistently well going into the 20th century. 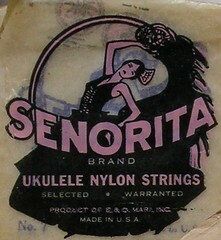 Since the conception of the ukulele in the year 1879, they have been using strings made with natural gut. It is this type of string that has gained so much popularity in the market, until the discovery of the nylon made by DuPont in the advent of the World War II. Aquila gut strings have been well known for making the finest gut strings, making use of the freshest gut available, which is in-line with the customs and traditions in Vicenza. Humidity and changes in temperature can easily affect your old gut strings, and therefore make them out of tune. Currently produced gut strings now have better coating and are more stable as compared many years ago. There simply is nothing like the warmth and harmonic tone of real gut strings. Nylon Strings – Upon the conception of the nylon string, the world of stringed instruments simply was never the same again. Strings made from nylon typically have more consistent properties and are uniform in diameter while also being able to deliver decent sound quality. And the best part is, they are really very cheap to produce. Currently, most ukuleles you will find in the market have strings made from nylon polymers. It is important to note however that not all nylons are the same. Each manufacturer will have its own grade of nylon polymer, and this makes each brand unique. Those cheap, low-quality nylon strings are usually made from the materials used to make the bristles of scrubbing brushes, and it is best to stay away from them. As for nylon strings, they usually need some time in order to settle down – this can be accomplished by “breaking-in” your strings first. And even after the strings have settled down, you will still need to make some adjustments in order to set your ukulele to the right pitch. NYLGUT Strings – Being a patented product line of Aquila, you can expect them to have a much more solid sound as compared to the regular monofilament strings. The only downside to them is that they tend to be more susceptible to cuts , which means they are less durable than monos. Fluoro Carbon Strings – This type of string is relatively new in the market and is entirely different and very dense type of polymer. It has a measurement of 1.6 which has a big difference over the nylon’s 1.3. Despite the smaller diameter of the strings, they still have incredible durability. Because of this, the resulting sound of the ukulele is crisp, lively, loud and bright. With regards to the cost, the Fluoro Carbon string is more expensive as compared to regular nylon, and is usually sold in “double” sets. Wound Metal Strings – This type of string has been coated with metal in order give the string additional weight but not compromise its flexibility. Metal windings are commonly used to coat the nylon floss core, which is quite similar to a dental floss. This coating is very important because without it, the string would have a very dull sound. Most ukulele users do not prefer this type of string because it can cause some kind of discomfort when you are dragging your fingertips over the string windings. In order to address this issue, manufacturers now make use of finer metal windings, which are commonly called “studio” quality strings. Wound Nylon Strings – A lot of manufacturers are now producing a new type of overwrapped wound polymer string. Flexibility is the primary feature of this string, and also has excellent sound quality. The only problem with this string is that you won’t be able to cut the string off because doing so will undo its winding and therefore will destroy your string. Steel Strings – This is one of the worst types of strings you can put in your wooden ukuleles. Although acoustic guitars, banjos and mandolins have metal strings, they are very much different from a ukulele and having metal strings along with it can really produce an unpleasant sound. And if that’s not enough, you can also easily damage your wooden instrument in the event that you over-tighten your strings. An exception to this would be the recently designed baby “electric guitar” ukuleles which were made to accommodate metal strings only. Intonation, as taken from the definition of Wikipedia, states: “Intonation, in music, is a musician’s realization of pitch accuracy, or the pitch accuracy of a musical instrument.” Having what is known as “bad intonation” means that the musician is playing or singing out of tune. Intonation can also refer to tuning. When it comes to stringed instruments, intonation matters a lot more than with other musical instruments. Since majority of stringed instruments are unfretted, the note can easily go out of tune in the event that a finger is too high or too low, even if it is less than an inch. In order to have good intonation, a musician needs to have years of practice and experience, which makes this the most difficult part of mastering a stringed instrument. Despite the majority of ukulele fretboards manufactured today being cut precisely by computer-guided laser cutters, issues sometimes exist in relation to the free string configuration of the ukulele, which is extremely short, and makes perfect intonation quite hard to attain. Also, ukulele strings which were made from plastic materials like nylon are not very precisely constructed as compared to their steel counterparts – those which are usually installed on banjos, mandolins and the ever popular guitar. Strings made of plastic tend to expand and eventually become flat, making them quite hard to use during the initial stages of use. And if that’s not enough, getting the right intonation greatly depends on the skills and experience of the musician. Intonation will also change in relation to the key played. Ukuleles have long been known as the instrument of “innocent merriment”, period. They provide hours of fun and enjoyment with every use, although they can’t be considered as acoustic physics laboratories having small sound chambers. With guitars, most people will usually invest a lot of money making modifications in order to have better intonation, and the ukulele not much that different. Even if the ukulele you are looking at right now is said to have the “prefect intonation”, chances are there is something fishy about it. If its the intonation of your ukulele that is giving you headaches, it may be a good idea to purchase strings of better quality such as well-known brands Worth and Aquila. You may be surprised on the really big difference this change will give. Intonation can also be achieved based on how relevant the note played is to the pitch as the musician moves up the fingerboard. In order to check the set-up of your ukulele, the 12th fret needs to sound exactly the same when played on an open string at a higher octave. For example, open A string first course 440Hz, 12th fret 880Hz). Playing a 12th fret harmonic and comparing it with a fretted 12 fret note is also a good way of checking your ukulele. A good instrument will always be able hit each note played exactly to the required frequency. Example is G=392 Hz, C=261.6 Hz, E=329.6 Hz, etc. When constructing a good instrument, intonation is always an integral part of its overall quality. Playability is also another important factor considered by musicians. How do we actually acquire that much needed intonation? Most people will tell you that it is just as simple as making the measurement from the 12th fret doubled, but the truth is, it just does not work. Always keep in mind that the instrument you are using contracts and expand, and that wood also breathes. The playing style of a musician can greatly influence the intonation of a instrument – someone who strums hard and bends the strings too much when playing the instrument makes more of a noise rather than music. On the other hand, a good musician will do the exact opposite and you feel like the instrument and the musician playing as one. Most people usually conceptualize that because the strings of a ukulele are fixed at each end, they will resonate in the same frequency. As it turns out, this idea is false. The idea here is, in the event that the string induces vibrations on the soundboard, standing wave patterns are created – this contains the entirety of all present harmonics. For every time the ukulele string is plucked, the vibrations created behave like waves which travel to and fro the medium being directed at each fixed end. There are particular sizes of waves which can last while on the medium, waves which won’t cancel each other out as they are directed back onto themselves. These types of waves are referred to as harmonics. They are classified as standing waves and deliver non-moving sound patterns. In the case of a ukulele string, there are quite a number of harmonically-related standing wave patterns that can be produced. The first pattern, known as fundamental or first harmonic, possesses the longest wavelength of all. Next is the second harmonic, which is also known as the first overtone, has a wavelength half that of the first harmonic and also two times its frequency. As for the third harmonic, it only has a third of the wavelength of the first harmonic, and triple its frequency. Based on these patterns, the succeeding harmonics has the same set-up when it comes to the frequencies and wavelengths. The harmonic patterns produced in a ukulele will always depend on the way the ukulele string is plucked. The pitch of the note we hear from the ukulele is relative to its fundamental frequency, while the timber of its sound is relevant to the sum of all harmonic structure. This concept can easily be seen when you play both a trumpet and a clarinet at the same note – the sound heard from each instrument can easily be distinguished. In the two instruments, they have the same fundamental frequency, but each has its own harmonic envelope which gives each instrument its own character. This concept is therefore also applicable to ukuleles, in that the concert, soprano, baritone and tenor produce different sounds because of the difference in their sizes. Besides the size of the ukulele, the sound produced can also be affected by other factors. These include the overall structure of the body, the firmness of the soundboard, the quality of the strings used, and the ability of the materials used in the ukulele in absorbing or reinforcing sound. For example, ukuleles made with plastic bodies and backs will sound a lot different than those constructed of wood. Another type of soprano ukulele, commonly known as the Pineapple-shaped soprano, boasts a more throaty tone as compared to the traditional-shaped soprano. This sound difference is, of course, attributed to the difference in body shape. For ukuleles made of wood, the sound produced will greatly depend on the type of wood used, its thickness and its internal bracing. Those which are constructed with bulky soundboards produce dull tones and do not have the same sharp “bark” possessed by ukuleles made with thin soundboards. Also, bulky soundboards are known to have extremely short tone resonance. High quality ukuleles have the ability to produce better sounds, thanks to the careful selection of construction materials used for the instrument. They always make sure that the materials used will have the longest resonance and work well together. Also, the type of wood and density is taken in consideration, making sure that the instrument can resonate freely and at the same time durable. Different species of wood can be used in making ukuleles. Examples include Spruce, Mahogany and Koa – all lending a unique sound to the instrument. Many old-fashioned ukuleles in the market today typically produce better sounds today as compared at the time they were built 7 decades ago. This is because of the internal stress undergone by the body over the years, which consequently relaxed it therefore giving it better resonance. These instruments are very sensitive, that even relative humidity can easily affect the quality of sound produced. Based on my experience, newly made ukuleles can sound much better once they have been used for around a year. It is only at this time that they are considered to be matured – just like with old violins which are sought after for their mature sound. When it comes to ukulele strings, always buy from reputable string manufacturers. High quality strings typically are uniform in diameter, have excellent durability, more flexible and give your ukulele that distinct sound. Never buy inferior quality strings – these are usually made with the polymer used in the bristles of scrub brushes. There is a well-known song entitled “Little Brown Jug” that says: “…if I had a cow that gave such milk, I’d clothe her in the finest silk…I’d feed her on the finest hay…and milk her 40 times per day.” Like the song goes, once you find the ukulele that will fit your preferences, make sure that you provide it with the best care: buying a protective case for it, supplying it with only the highest quality strings, and using it as often as u can! Enjoy! For this type of stringed instrument, four sizes are available, to which the volume and tone are relative to its size. In Hawaii, the standard-sized Soprano is the preferred ukulele and is also the smallest in size. By the year 1920, changes have been made with the design, increasing the ukulele’s size and therefore giving it a deeper and louder tone. This was then known as the Concert ukulele. After some time, a Tenor ukulele came out, with size greater than that of the Soprano and Concert. This consequently translated into increased volume and deeper bass tone. This sound quality can often be attributed to the bass strings of the Tenor ukulele (1-2 strings), which gives it excellent resonance. The Baritone ukulele comes next, with body width extending to 10 inches and has the DGBE configuration of strings similar to a guitar, which in essence makes it a mini-guitar with 4 strings. If you are looking for a classic, gentle and bright tune, then your best bet would be the Soprano and Concert ukulele. For a bigger, deeper and more “guitarish” sound, then the Tenor and Baritone is an excellent choice. Despite the popularity of the Concert and Tenor ukuleles, some clients still prefer the more traditional Soprano and Baritone variants. There are also multiple-stringed ukuleles available besides the regular four-stringed variants. For example, the Concert type ukulele can be custom-fitted with as much as five strings, placing the two upper most strings in high unison. As for the Tenor and Baritone ukuleles, they are also available in configurations of either six or eight strings.